Huawei or Honor, which brand makes the best cheap smartphones? Huawei has taken on the smartphone industry in a big way over the past few years, and in the midst of the takeover, its sub-brand Honor has emerged to become a brand of its own. We got hands-on with the newest Honor and Huawei smartphones to help you decide which brand is your perfect match. While Huawei may need little introduction, Honor, which was previously known only as Huawei’s sister brand, has stepped into the spotlight as a growing force of its own. 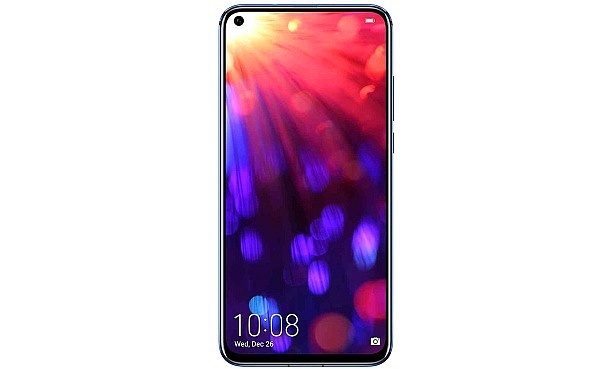 Like Huawei, it has a range of phones at different prices, and like Huawei, it is challenging what’s possible at the budget end of the market with enviable specifications and, in many cases, stunning designs. We tried out the Honor 10 Lite and Huawei P Smart: two low-cost phones that will set you back around £200. If your budget will stretch further, consider the Honor View 20, or the popular Huawei P20. We also take a look at how the brands perform overall in our tough lab tests. Browse all our Best Buy mobile phones to see which brands make our coveted list. Two smartphones with impressive specifications that look far from budget on the surface. What’s immediately impressive about the Honor 10 Lite is the almost bezel-free display – it’s a far cry from cheaper models we had to choose from in the smartphone market just a year ago. It’s big, though. For just under £200 this Honor smartphone comes with a massive 6.21-inch screen and 64GB of storage on the standard device. The teardrop-style notch matches the trend we’ve been seeing, not only on Huawei smartphones but also on pricier devices such as the OnePlus 6T, as a method of maximising the screen size. And the Honor 10 Lite isn’t done there in challenging far more expensive rivals – it comes with a 3,400mAh battery and dual front-facing 13Mp + 2Mp camera, plus remarkably, a 24Mp self-camera. But for such a bargain, is there a compromise? We’ve been hands on with the Honor 10 Lite to find out. Not to be outdone, Huawei has kicked off the year with an upgrade to a device we’ve seen previously. 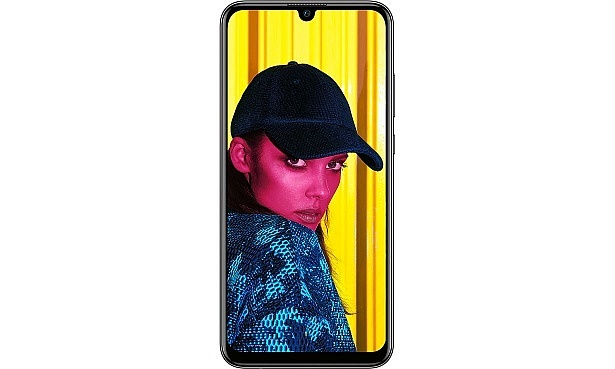 The Huawei P Smart was first launched in February 2018, and the newer model certainly shows improvement on paper. It has a very large 6.21-inch screen, compared with 5.7 inches on the previous P Smart, and the rear of the device now has a camera-like horizontal design. It might look similar to the Honor 10 Lite, but it doesn’t quite match up on paper. A similar rear camera array is backed up by only an 8Mp front camera, the the battery size here drops to 3,000mAh. Still, neither megapixels or mAh figures are a guarantee of quality or longevity, so this battle is far from over. Read our first look review of the Huawei P Smart (2019) to see how it all comes together. Browse our guide to the best cheap smartphones for more budget bargains. Double your budget and you’re in the realms of Honor’s new flagship, the View 20. But how much better is a £500 phone? This smartphone is the newest flagship release from Honor. It’s the sequel to the Honor View 10 released in January 2018, and just from design you can see a huge difference from its predecessor. 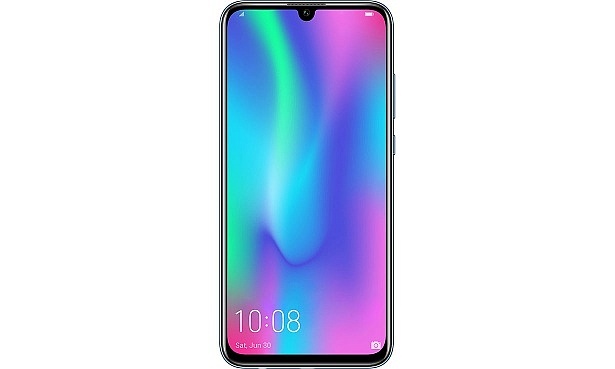 It has a huge 6.4-inch screen with an All-View display, as well as an interesting front-lens design: the front camera is hole-punched into the top left of the screen, allowing for a clear display. Inside you’ll find the Kirin 980 processor chip, famed by Huawei’s biggest devices including the Huawei Mate 20 Pro. But the show-stopping specs don’t end there. The Honor View 20 houses the world’s first 48Mp rear camera, which is paired with a 3D camera lens and flash, and 25Mp front-facing camera. Before we fell head over heels for these features, we decided to do a hands-on review. Read our first look of the Honor View 20 to see how it fared. 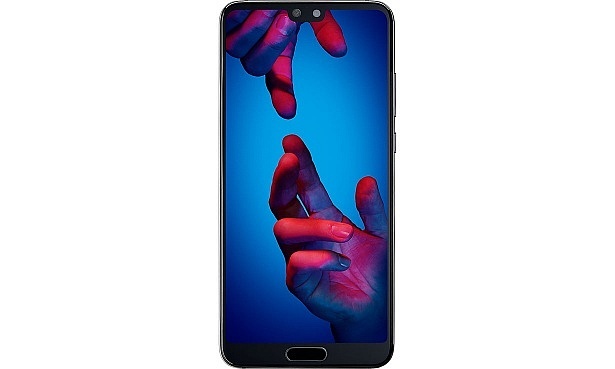 The Huawei P20 is a great example of the range of devices that Huawei has on offer. Unlike the large screen behemoths we’ve looked at so far, this smartphone has a 5.8-inch display. While this may seen unimpressive compared with the other Honor and Huawei devices, in fact it’s the same size as the screen on the iPhone XS. It has an impressively high-spec processor, the Kirin 970, and 4GB of Ram. Like the Honor 10 Lite, it comes with a dual rear camera. One is a 12Mp lens shooting in colour, and the other is a 20Mp lens shooting in black and white, which in theory should work together to produce balanced images. To find out if this claim and others are true, we sent this smartphone to our lab for testing. Read our full review of the Huawei P20 to see how it performed. 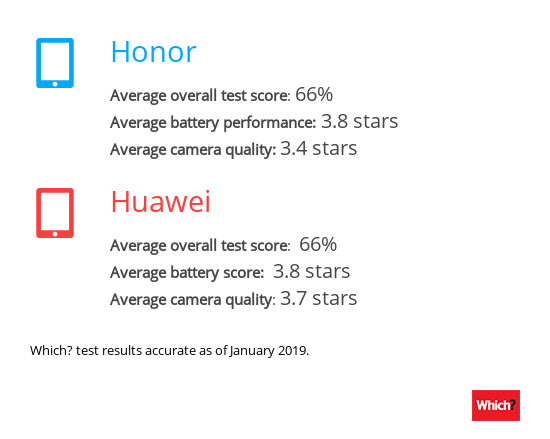 Honor vs Huawei – which performs best in our test lab? 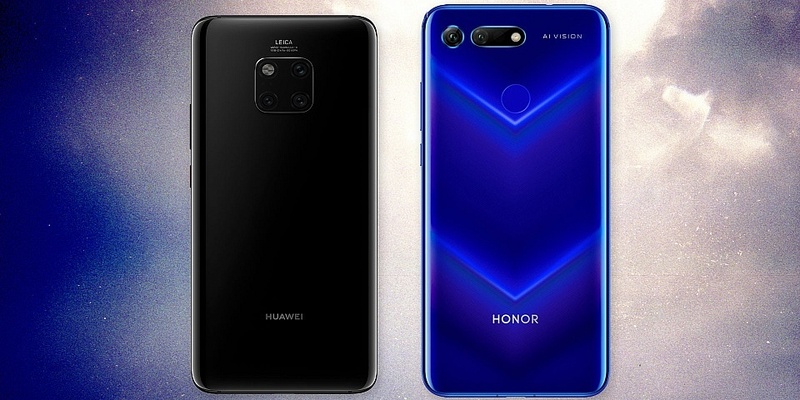 Just based on the models we’ve looked at above, it’s fair to say that Honor and Huawei smartphones have a lot of similarities. We’ve found the same results in our testing. As you can see, there’s very little in it. In fact, based on average review score, the two brands are neck and neck with 66%. Battery performance at brand level is also even, but Huawei does have the edge in one area: camera quality. Of course these are brand averages, and we did see a fair bit of variation between individual models in our reviews. For more help choosing, read our guide on which Huawei or Honor mobile phone you should buy. To find out if any Honor or Huawei smartphones ranked in our best smartphones for this year, read our guide on the top five best smartphones for 2019.